19 rentals available: canvassed Bungalow, Gypsy caravan, Mobil homes, Cabins. 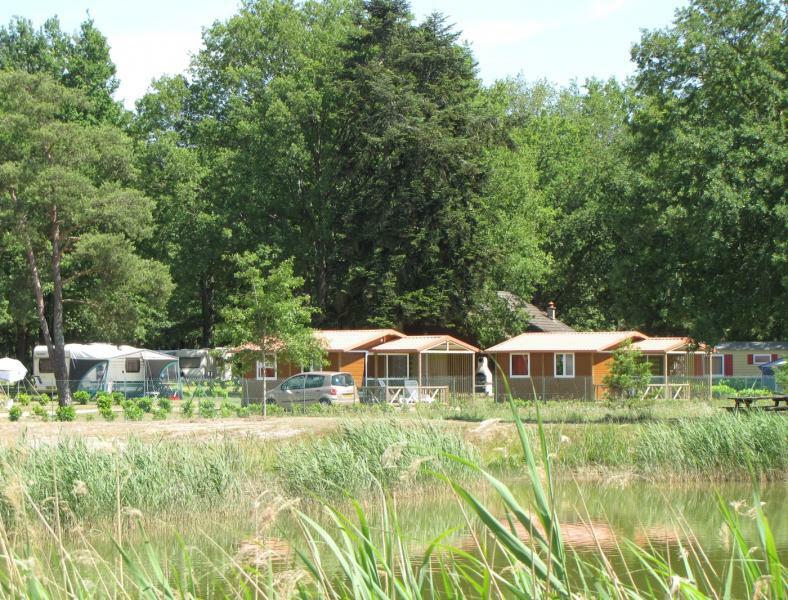 You will find at the Camping des Etangs the lodging you are looking for from 1 to 3 bedrooms. We can accommodate up to 110 people on our site. Two new structures installed in 2015: a Mobil-home high standing covered in wood 40 m2 with 3 bedrooms including a master suite, a Mobil-home 30 m2 large space 2 bedrooms, equipped for people with special needs. Both are equipped with a covered terrace of 15 m2 with private view on the pond. All rentals are equipped with heaters, bathroom, and fully equipped kitchen. For the gypsy caravan and the canvassed, the sanitary facilities are just next to it. Our friends’ pets are welcome. You can choose the length of your stay; the minimum is 2 nights in high season July-August. View on the pond and covered terrace, this large space seduces with its master bedroom (adjacent bathroom and toilets) and multiple closets. Two over bedrooms with bathrooms and separate wc and a convertible to welcome a guest! The kitchen is fully equipped and the living seems bathed in the light with some large French windows with an open view, not overlooked. A structure large space, adapted for people with special needs. Two large bedrooms with one with buck beds. Bathroom with WC. The kitchen is fully equipped, the living room opens on a large terrace with a view not overlooked on the pond. Three bedrooms including one with buck beds, bathroom and separate wc, living room with a fully equipped kitchen opening on a covered wood terrace. Each room is equipped with a heating system; this rental is available all year long. Two bedrooms, bathroom and WC separate, living room with a fully equipped kitchen opening on a covered terrace in wood. Heating system in each room, this rental is available all year long. Small structure one bedroom with a large bed, very cozy, fully equipped kitchen , bathroom with WC, living room convertible on covered terrace. Each room has a heater and this rental is available all year long. Welcomme to large families, blended or two groups of friends, the chalets 3 bedrooms with covered terrace, will welcome you for week end or for a week of discovery of the area. Each room is equipped with a heater, rolling shutters for a guaranty of sleeping in. They have a fully equipped kitchen, wc and separate bathroom. With all of this you will enjoy your stay ! Ideally located on the front of the pond, Mobil-home 2 bedrooms chalet’s type, fully equipped kitchen, bathroom and separate WC, shaded, private view on the pond from the terrace. You can enjoy it for long hours during the summer time. Chalets 2 bedrooms 26 m2, to welcome 4 people, the plus: a covered terrace, rolling shutters, a heater in each room, a fully equipped kitchen, bathroom ans separate wc.All of this will allow you to have a wonderfull stay.